A thriving business and industrial estate, Riverhorse Valley is home to a range of businesses and services. Find the one you are looking for by searching the categorised directory accessible below. Riverhorse Valley is situated on the N2 north bound between the Umgeni Road and KwaMashu interchanges in what is referred to as N2 Section 25. 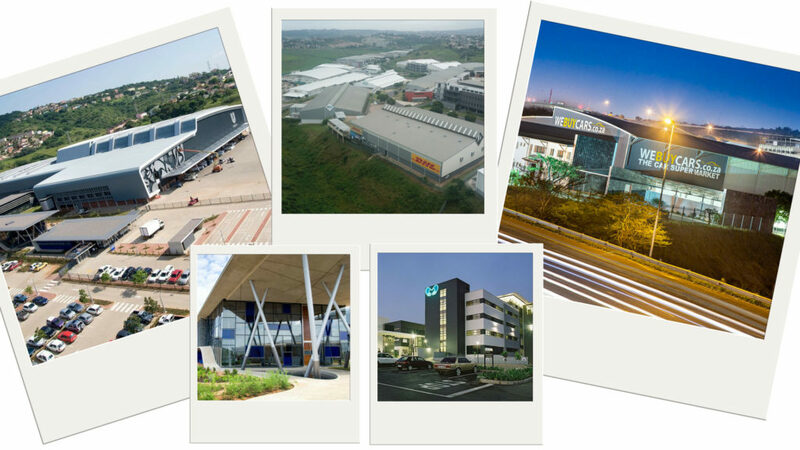 The Estate spans both East and West sides of the N2 and the main landmarks identifying the Estate are the 2 petro-ports and eThekwini Hospital and Heart Centre at the Queen Nandi Drive interchange; the main access and egress point to the Estate. Thus in the intervening 60 years the nature of the area had vastly changed. The present Riverhorse Valley Business Estate was part of this lake. The name ‘Sea Cow Lake’ has still been retained for a portion of the area between the Estate and the Umgeni River. Riverhorse is another derivative of ‘hippopotamus’, from whence the Estate gets its name. By the 1930’s only a small remnant of the former extensive lake remained, the remainder having been drained and used for sugar cane cultivation. In the late 1960’s the last of the swamp was converted into a series of large oxidization ponds that formed part of the Sewage Treatment Works of Durban. In the early 1970’s the N2 freeway was built through a portion of the lake, and its outlet into the Umgeni River was canalized. 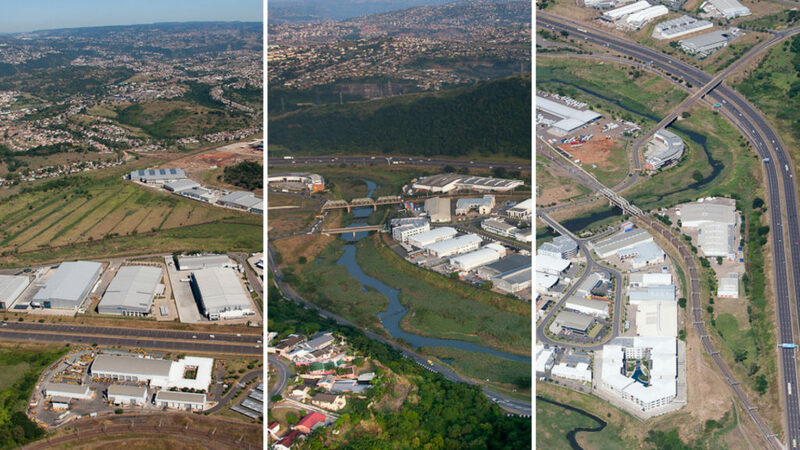 With the closure of the Mt Edgecombe Sugar Mill and the scaling down of cultivating cane close to Durban, and the closure of the Effingham Brickworks in the early 1990’s, potential existed to develop the area as a business estate, due primarily to its locality, two kilometers north of the Umgeni river and bisected by the N2 freeway. The bulk of the area was owned by the Tongaat Hulett Group (under cane to the west of the N2 and the Effingham brickworks east of the N2). Other smaller portions owned by eThekwini Municipality, SANRAL and Propnet were incorporated into the Estate. 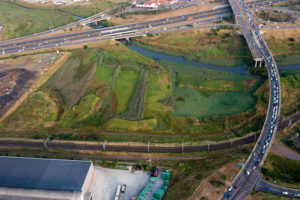 Development plans and preliminary reports on the Geotechnical and Hydrological aspects of the site and river were initiated by Tongaat Hulett in 1993, and discussions commenced with SANRAL, eThekwini Municipality and Tongaat Hulett on the financing of a new interchange on the N2 to access the site. The sale of land to Total SA for the provision of the Petro-ports assisted this process. The lengthy process of approvals from provincial and local authorities was followed by an Environmental Scoping report (1999), Environmental Impact Assessment (2000) and Record of Decision (2001). 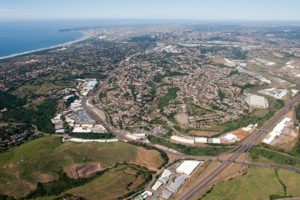 A decision by eThekwini Municipality to construct a new link road (Queen Nandi Drive) between the North Coast Road in Briardene and KwaMashu triggered the commencement of the development. A joint venture partnership between eThekwini Municipality and Tongaat Hulett to develop and sell the sites was formed in June 2000, and construction commenced on the new link road, the bridge over the Umhlangane River, and the Queen Nandi Drive interchange, as well as the internal roads and site services commenced in 2002. The bulk of the development consisted of the creation and cutting of developable platforms for the various Erven and careful consideration and survey was conducted to ensure that all sites were above the 1 in 100-year flood plain level. The cutting and filling of platforms was challenging in itself given the shale content of the entire area, some areas even requiring blasting. With these achievements came the establishment of the Riverhorse Valley Management Association in 2003 and the start of construction of the Business Estate in late 2004. General opinion at the time supported the idea that an investigation be carried out to possibly re-introduce hippos to an area of the river within the Estate. A primary requirement in this regard was to obtain a permit from KZN Wildlife. A consultant was appointed and a comprehensive report submitted to them in June 2003. Discussions with them continued until April 2008, when KZN Wildlife took a final decision not to issue a permit because of safety and other concerns’ which in all probability was the correct decision at the end of the day. Public Open Spaces of 26 hectares. The above areas exclude the N2 freeway, Rail reserve, Total petro-ports, Queen Nandi Drive and Newlands East Drive. The suburb was created through the Effingham Development Joint Venture partnership between eThekwini Municipality and Tongaat Hulett [Developments], at the time known as Moreland Developments, when parcels of land from the surrounding suburbs of Effingham, Greenwood Park, Avoca, and Newlands East, were consolidated to collectively create Riverhorse Valley. In 2003 the Riverhorse Valley Business Estate Management Association was registered and construction of Estate began in late 2004. 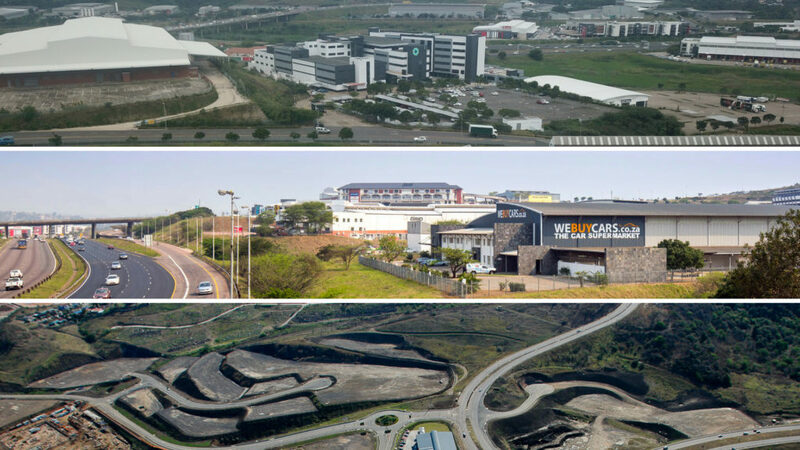 Conceptualised and developed around a clear concept plan underpinned by a vision of creating a blue-chip facility, the Estate stands apart from other traditionally gated industrial estates, by integrating with its surrounding areas and communities as well as its natural resources and open spaces. This vision, supported by strict development guidelines and environmental management procedures, have together resulted in a first class; managed business precinct which embraces community and environment in equal measure. 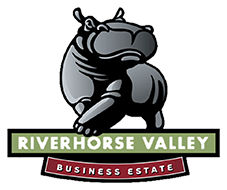 The role of the Riverhorse Valley Business Estate Management Association then is to ensure that these values continue to be upheld by its members, role players, and most importantly, itself. The Riverhorse Valley Business Estate, is available as a PDF in the form of a Development Concept Plan, noting erven, land use and cadastral information. The ratio’s and socio-economic impact of the development of the Estate are 70% manufacturing and warehouse; 10% commercial and services; 15% office and 5% Residential. 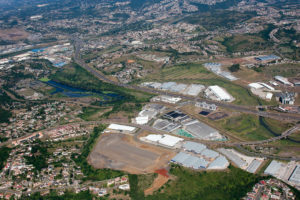 It is estimated that some 12 000 construction and construction-related jobs were created in the city and province during the development of the Estate, with nearly 4 000 of these directly on site. Two thirds of these job were generated in the local and KZN building supplies sector. It is estimated that some 10 000 permanent jobs were created through the Estate’s development. Rates income to the eThekwini Municipality is projected at between R20 – R45 million p.a.